Buy H&M gift cards online at a discount to save money on women’s clothing as well as men’s clothing, shoes and accessories. H&M strives to give their customers unbeatable value by offering fashion and quality at the best price. H&M offers women’s clothes as well as men and children’s styles to keep up with the latest in fashion no matter your age. From dresses, jeans to jackets and jewelry, you can find everything you need at H&M, plus, new moms can shop the H&M Maternity section to save big on cute maternity clothing! 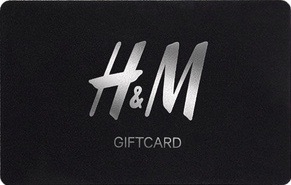 Shopping Tips: H&M gift cards can be redeemed at participating H&M stores only. H&M gift cards do not expire. Below is a listing of our favorite places to buy H&M gift cards. There are always great deals and discount available when buying these so check back often. We will keep this list updated to reflect the best rates when possible. If you’re looking to buy clothing to add a sophisticated air to your appearance yet still save money, then this is the deal for you! These cards are valid for use at any H&M store. Please note, H&M gift cards cannot be redeemed online at hm.com but you can use them to shop at your nearest H&M location. Buy H&M gift cards online at a discount and save on all of your fashion essentials. Read more on Gift Cards Discount Rates.